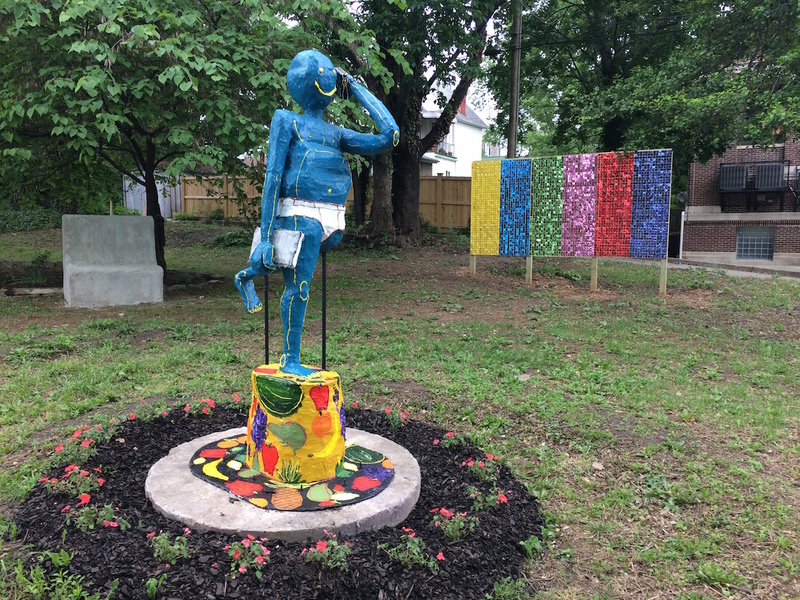 Artist Lisa Dillin has spent the past six months transforming a vacant lot in the Coldstream Homestead Montebello neighborhood into a temporary sculpture park. The city-owned lot—adopted by the CHM Community Corporation through the Baltimore Office of Sustainability—listed the site as a potential space for art through BOPA’s Lots Alive grant program. 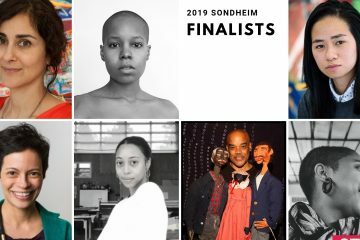 Using her experience as an educator, Dillin developed a fellowship program to mentor eight selected artists as they created work for the site. Approaching the sculpture park from Kirk Ave, Alice Gadzinski’s piece sparkles atop the slope in the background, even on a gray day. “Reccess” takes its inspiration from television color bars, used to calibrate and align transmissions when there was no broadcast programming. Here, Gadzinski used the color pattern as a pause from technology and a backdrop for a space in which one goes from being an observer to being a performer. “Recess” will be used for just that during the opening celebration June 3 for a performance by Kaza Gangus, a Liberian reggae hip hop artist from the CHM neighborhood. Of the eight fellows, Leanna Wetmore is the only CHM resident. 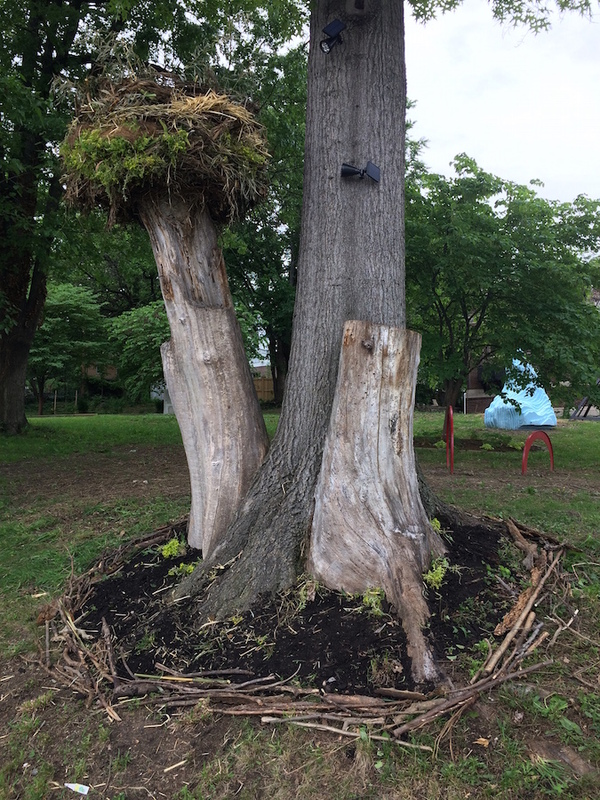 At the corner of Kirk Ave and Homestead Street sits her monumental bird’s nest, perched atop one of two dead tree stumps, about eight feet high, on either side of a mature tree trunk. Titled “Home,” her piece makes use of a small part of the debris that came from the site itself, a haven above a ring of twigs and fresh dirt surrounding the three trunks. 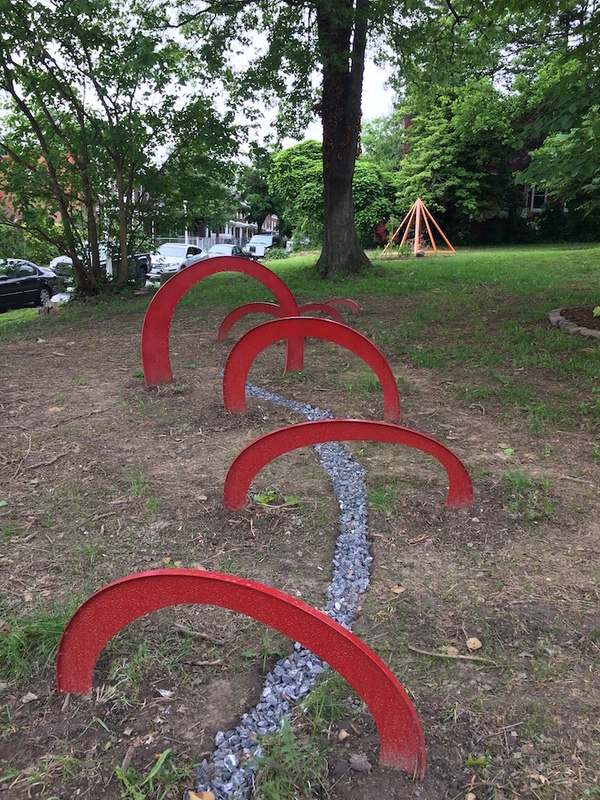 Just behind this piece is Lorenzo Cardim’s “Over and Back, Over and Back Untangles the Thread,” a series of short red metal arches meandering up the gentle slope over a line of rocks weaving beneath the arches, as if stitching the landscape together. Mark Washington, Executive Director of the CHM Community Corporation, has been a huge resource to Dillin throughout the process of transforming the vacant lot into a sculpture park. “The hardest thing has been the landscaping and finding resources for landscaping. It was so much more expensive that I ever could have imagined,” Dillin said. “All of these neighborhoods [participating in Lots Alive] have put forth an interest in being considered, but their level of interaction is up to them. Mark has been very involved. He has really been essential, because I just wouldn’t know about people around here or be able to obtain certain services, like the Department of Public Works who helped us with garbage removal.” The site of the new CHM Sculpture Park was one of the few vacant lots that specifically requested art for the location. While clearing the site Dillin and a group of volunteers unearthed everything from a bag of raw chicken to a mattress, a five-gallon bucket of used oil, a tire and a child’s backpack. Overwhelmed by the amount of trash and work during the initial day of clean-up, Dillin recruited the help of a landscaping crew that was doing yardwork nearby to cut the grass and weeds, already knee-high in March, and later contracted that same business to remove three dead trees on the property. Dillin restored three planting beds with a mix of coneflower, swamp roses and milkweed from Herring Run Nursery, operated by Blue Water Baltimore—all native perennials that are non-invasive and helpful to birds and butterflies, while others were donated from a community garden in Hampden. The swamp roses were inspired by a rosebush that CHM resident Alan Scott had previously planted in the lot. Scott will maintain the landscaping for the duration of the project throughout its six-month duration. What is the role of art? Is it enough to inspire through these pieces that are intellectually engaging? Or do some of the people in this neighborhood really just need job training or other financial resources? 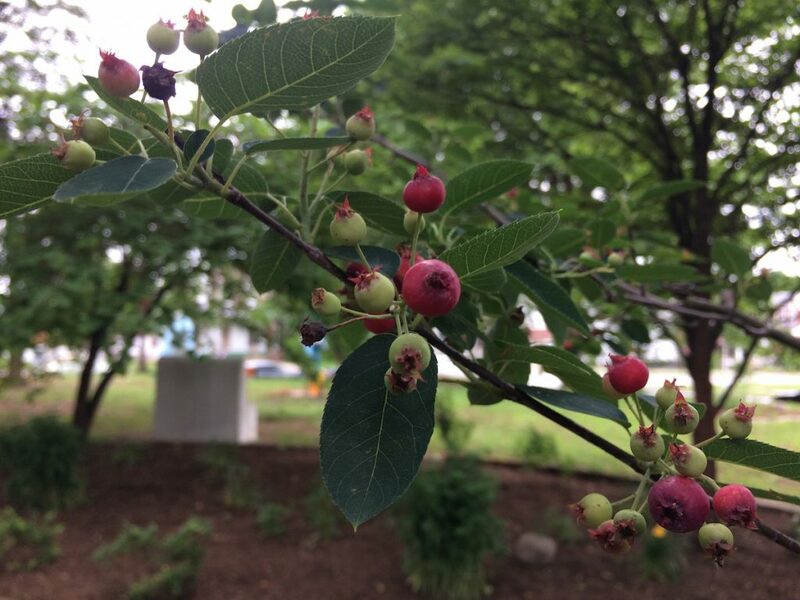 The CHM Sculpture Park officially opens to the public Saturday, June 3 with a BBQ dinner catered by Sugar Therapy and a series of performances, including “Tender Picking” by Christine Stiver, that involves cooking live crabs on site. 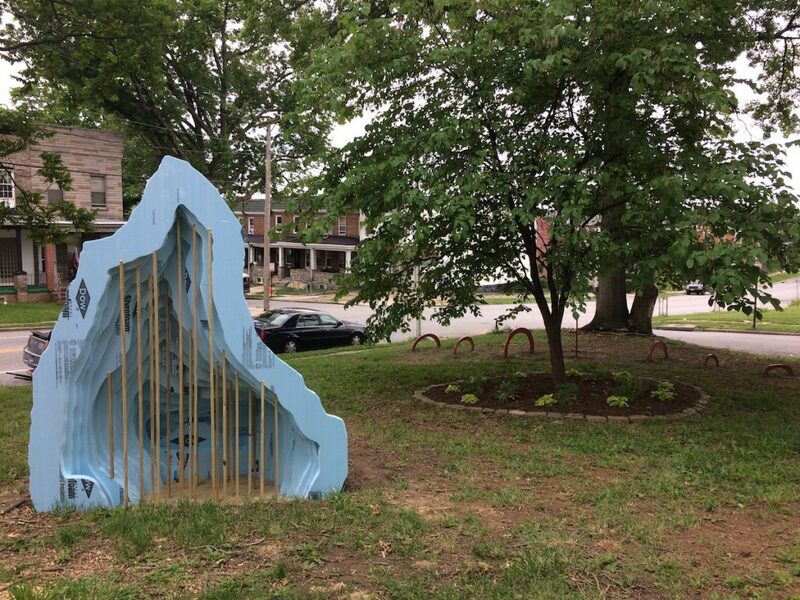 Dillin has distributed 350 fliers to every home within a three-block radius, and will also host two free all-ages sculpture workshops this summer on June 17 and July 15 in hopes of continuing to engage the community. Dillin’s sensitivity to the physical site and the impact of the work she is coordinating there on the surrounding community is admirable. 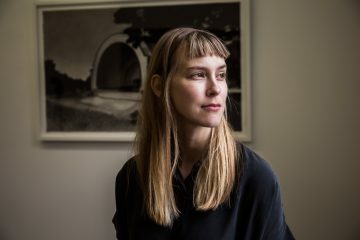 She’s created a site for sculpture with the seeds of sustainability and a lasting impact. 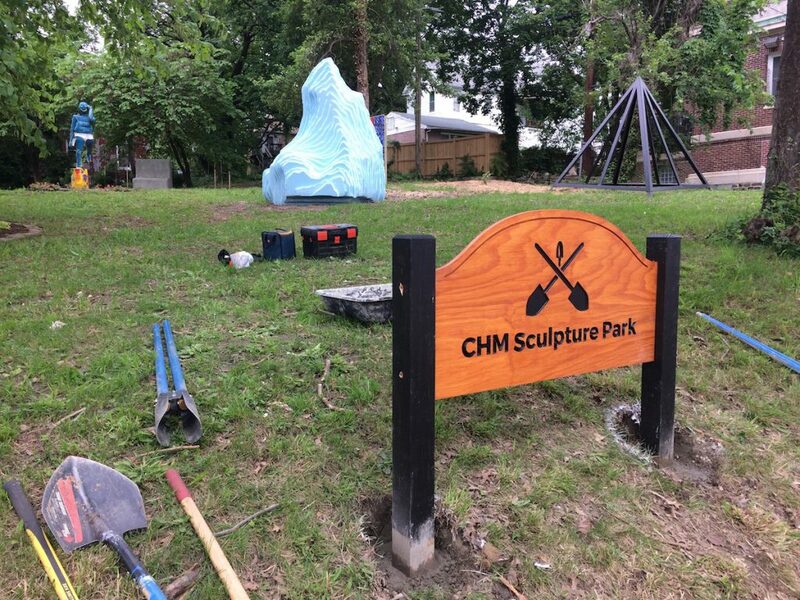 CHM Sculpture Park is located at 1450 Homestead St. All events are free and open to the public. LabBodies I Considerations: 5:30 – 7 pm.